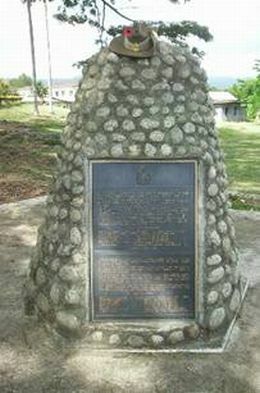 THIS MEMORIAL MARKS THE SITE OF A PRISON CAMP OF SURVIVORS OF THE FIRST DEATH MARCH FROM SANDAKAN TO RANAU FROM JANUARY TO APRIL 1945. 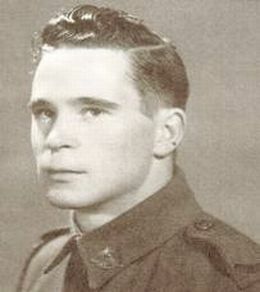 OF THE 2000 AUSTRALIAN SOLDIERS OF THE 2 ND A.I.F. AND 750 BRITISH SOLDIERS OF THE BRITISH ARMY WHO LEFT SANDAKAN ONLY 6 AUSTRALIANS SURVIVED. ON THIS ACTUAL SPOT, VX 52128 GUNNER ALBERT NEIL CLEARY, 2/15 TH FIELD REGIMENT, ROYAL AUSTRALIAN ARTILLERY, WAS CHAINED TO A STAKE AND BEATEN AND STARVED FOR 11 DAYS BEFORE HE FINALLY DIED ON 20 TH MARCH 1945, AGED 22 YEARS. THIS MEMORIAL ALSO COMMEMORATES THE COURAGE AND BRAVERY OF THE LOCAL PEOPLE OF SABAH, WHO SO GALLANTLY ASSISTED THE PRISONERS-OF-WAR AGAINST OVERWHELMING ODDS.